Even Metallica members get into the spirit of Christmas giving. 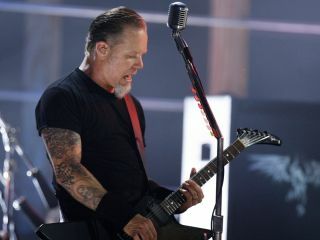 Takes James Hetfield, for example: the frontman recently donated 330 acres overlooking California's Lucas Valley for preservation as farmland. "This is a really exciting offer," said Steve Kinsey of the Martin County Board of Supervisors, who unanimously accepted the donation of the easement, which will preclude development on the land known as Luiz Ranch. This is not Hetfield's first gifting of land to the community: previously, he donated 438.5 acres as an open space easement. Both plots of land are within a short distance of the singer's home. Hetfield's land use consultant, Scott Hochstrasser, characterized the donations as part of the singer's desire for privacy and to preserve open space. County officials indicated they are close to a deal with Hetfield that would reroute a hiking trail that crosses his property. Hetfield recently constructed a fence to block use of the trail.